Atlanta (CNN) On a drizzly Saturday morning, nearly 200 people gathered in a downtown conference center here for what was billed as a “black joy” brunch — complete with mimosas, glasses of sweet tea and plates of fried chicken and waffles. As a DJ blared Beyoncé’s “Crazy in Love” over the sound system, the crowd of mostly African-American women pulled out their cell phones, logged into an online voter-outreach tool called Relay and began a texting marathon. In a little more than two hours, they had reached 65,000 infrequent African-American voters in a swath of rural Georgia, known as the Black Belt. Their messages warned of purges of African-American residents from the voting rolls and urged support for Stacey Abrams, the Georgia Democrat who’s vying to make history as the nation’s first black female governor. 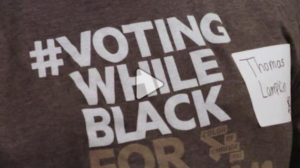 Faced with a “bigoted and destructive agenda” in Washington, “black voters are seeing this as a transformative moment for the country,” said Adrianne Shropshire, who runs BlackPAC, a two-year-old political action committee. “They are using their votes as their resistance,” she said. 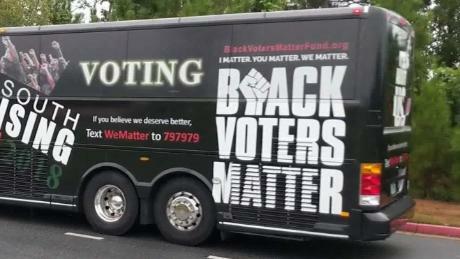 Other groups working to change the complexion of the midterm electorate include PowerPAC Georgia, a group affiliated with San Francisco lawyer and veteran Democratic strategist Steve Phillips, which is plowing in $5 million to help turn out 100,000 infrequent African-American voters who live outside the metro Atlanta area. Collective PAC,which bills itself as the EMILY’s List for black candidates, is launching a national text-messaging program to reach about 2 million African-American voters in at least five states, including Florida and Mississippi. The Black Economic Alliance, a group started in this election cycle by African-American executives, is spending $2.6 million in a last-minute voter-mobilization push in 15 federal and state races. Color of Change PAC, whose financial backers include labor unions and Democratic billionaire Tom Steyer, plans to spend about $5 million to reach 1 million black voters. And a coalition of African-American groups, led by the Black Women’s Roundtable is trying to mobilize at least 150,000 black women to vote in Georgia. Quentin James — who co-founded Collective PAC with his wife, former Obama campaign aide Stefanie Brown-James — said he also wanted to help turn the energy feeding Black Lives Matter protests into something more durable: greater political representation. “People are saying, ‘I don’t just want to protest. I want to run. I want a seat at the table to make the change,’ ” he said. Black turnout helped swing two high-profile contests — the battles for a US Senate seat in Alabama and Virginia governor — to Democrats last year. Exit polls in Alabama’s special election for the Senate found that 98% of black women who voted in that election backed Democrat Doug Jones, helping him beat Republican Roy Moore to become Alabama’s first Democratic US senator in a quarter-century. Like Georgia, the contest in Florida is highly competitive. A recent CNN poll found Gillum 12 points ahead of his Republican rival, former US Rep. Ron DeSantis. The new African-American organizations say they expect to make gains with activism that extend far beyond the marquee races of the midterms. Brown, for instance, is advocating for a referendum on the Nov. 6 ballot in Nashville that would create a civilian-led board to review police actions. The Color of Change PAC is mobilizing voters to influence local prosecutor races around the country amid concerns about excessive police force. Wesley Bell, a Ferguson, Missouri, city council member who received support from Color of Change and the Collective PAC, in August toppled longtime St. Louis County prosecutor Robert McCulloch in the Democratic primary. McCulloch had faced intense scrutiny over his handling of the investigation into the 2014 fatal shooting by a white officer of a black teenager named Michael Brown in Ferguson. They face rough terrain. Georgia hasn’t elected a Democratic governor in two decades. President Donald Trump won the state in 2016 by 5 percentage points. So far, early voting is skyrocketing in Georgia. Nearly three times as many people had cast ballots as of Friday afternoon as had during the same period in the 2014 midterm elections, according to statistics compiled by Georgia Votes, a privately run website tracking voting data. African-American voters accounted for 29.3% of the total. Patricia Benjamin-Young, 51, said she had cast her ballot on the very first day of in-person early voting to ensure nothing got in the way of her support for Abrams. Nearly a week later, encouraged by members of her church, the corporate auditor joined Color of Change’s brunch and sent her very first peer-to-peer political texts. In all, she communicated with about 30 people. Only one texted back “STOP,” she said. One had voted already, and several others said they wanted to cast their ballots on Election Day. “I felt good about knowing that people are getting out and are registered to vote,” she said. Benjamin-Young also had a little fun, joining dozens of other participants who clutched their phones and continued texting while dancing the electric slide. Other attendees posed for photos against a wall adorned with pink paper flowers. Organizers encouraged the party atmosphere.